Overnight I developed a skin rash on my stomach. I have no idea what this skin rash is or where it came from or whether it is something to be concerned about or not. The skin rash does not itch at all and it is not painful unless I scratch the affected skin rash area. I am concerned about the rash and I do not want it to be there. I am 15 years old, and I am not sexually active and so I do not believe it is any kind of rash caused by a STD, etc. The only thing I can think of is that this might be a sweat rash or heat rash. I am involved in a lot of sports, and tend to get very hot and sweaty often. I know this is not strictly a help website, but I cannot find any answers relevant to me and this type of skin rash on my stomach anywhere else. Any help would be really appreciated. 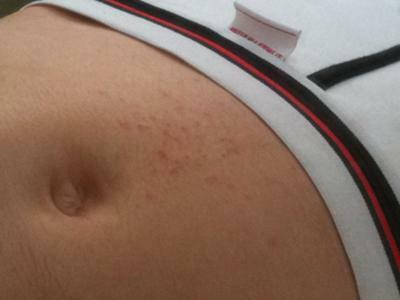 I have a rash on my stomach for about a year now and half of it doesn't itch, it's just there. I went to a dermatologist and he said it is a reaction to perfume or lotions. I went to an allergist and he said to go back to the dermatologist. Can anybody help, I am sick of this rash. I have a rash on my entire stomach. It is spreading to my thighs and chest and also my back. It must be a heat rash. At school, I dance right after physical education class and so I sweat a lot and it is always hot where I live so even more sweat. It has been about four days and it hasn't gone away and I need to figure out what this rash is! I have the same rash and my two and a half year old daughter has it. I wouldn't think it's a sweat or heat rash, because I rarely sweat unless it is a really hot day, and my daughter does not sweat at all. So I'm very confused about it. I have been trying to find answers myself. I have been to the doctor and she said it was because of the sand my daughter had played in two days before, but I never went near the sand myself and so I do not think it's that either. I had a feeling it might be bedbugs. If it's not that, I'm definitely dumbfounded and out of options. If anyone had helpful advice please pass it along. I have the same problem but it is everywhere and it does not itch! I went to the doctor and all they can say is "Did you eat anything new"? or "Did you recently use new detergent, soap, etc"? My rash has also spreaded to my thighs and a little on the inside of my arms. If you get any information on your skin rash problem please let me know. I am also in dance class and tend to sweat, but I am uncertain if it is a heat rash though, and it really bothers me. Looking at the picture you have submitted and reading your skin rash symptoms, it does not look like this is any kind of serious skin rash. You may be correct in assumming it is a heat or sweat rash. The heat and sweat in combination with friction of clothes in the area could have caused the skin rash. I would keep an eye on the rash for the next couple of days and see what happens. If it gets worse, then perhaps a visit to a doctor may be required to determine why it is there. In the meantime you could try something like hydrocortisone cream (over the counter strength) to treat the rash. Speak the pharmacist and he/she should be able to point you in the right direction.